I finally received my September box after knowing that others have received theirs days ahead. Are topboxes shipped out last for the West Coast subscribers? I wish there was some way for everyone to receive the boxes at roughly the same time that way we don’t run into spoilers. – I do love Benefit products, but have never really tried their mascaras. I am still on the lookout for a holy grail mascara that holds a curl, lengthens and provides volume, but does not clump, flake, and most importantly, smudge. Is there such thing out there?! Anyway, I heard this mascara smudges, so I will test it out and see. – I have not heard of this company before and it is apparently made in Spain. The fragrance of this product sort of reminds me of laundry detergent.. Is that a good or bad thing? – The packaging of this sample is very chiq. This is supposed to be a primer that smoothes the appearance of lines, pores and imperfections. I wonder how good this works! – This is a Canadian company that I have actually heard of before, but have never tried any of the products. This is a very decent sized sample of a rejuvenator product that is said to brighten and reveal softer looking skin. Can’t wait to try this out. I am content with the products I received, but have definitely received better boxes in the past. I seem to always receive tons of mascara samples and would prefer other make up products to try out. Also, upon looking up reviews of other September boxes, I discovered that some subscribers received a free bonus Balenciaga bag to be redeemed at Holt Renfrew (Theoretically, they received 5 items)! I understand that only those that received the Balenciaga perfume sample were able to also get the bag, but I don’t think that’s fair. Just because we opted out of a perfume sample, we miss out on a nice little bag?! These should be available for everyone and not only certain people. I believe everyone received a coupon for a free nail file from Holt Renfrew in a previous box (Correct me if I’m wrong!). If you are not able to accommodate everyone for a bonus item, perhaps you should not give them out. Please try harder next time, Topbox! 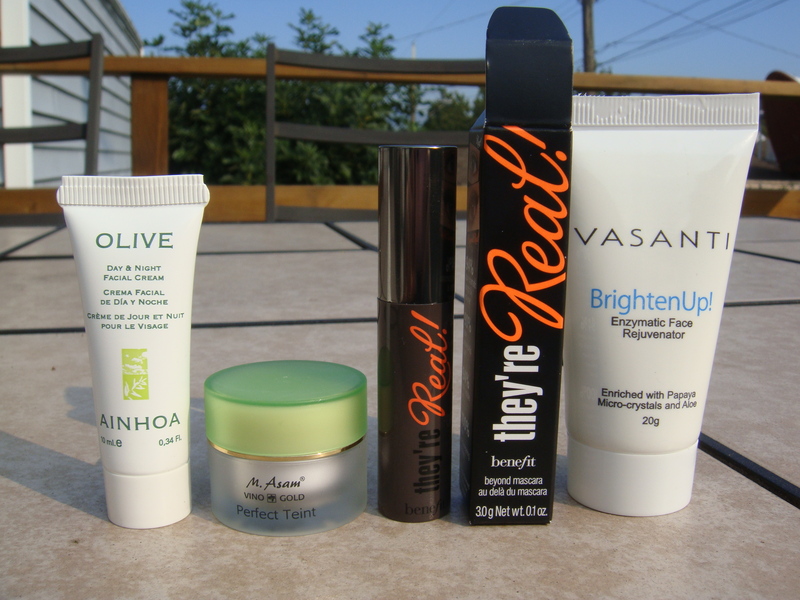 What did you receive in your September Topbox? October 2012 Topbox « take her word. Hey nice review! I got the same as you except I received 2 shampoo/conditioner pouches rather than the olive cream. I just started a blog today so going to try and get my review up tomorrow! I was upset about not receiving the balenciaga bag either! I really regret not choosing to get a perfume sample, but I guess you win some you lose some. I just feel like they should grant the people who did not receive the extra pouch something complimentary next month to make up for it. I saw your post on topbox’s wall and was wondering which company you were referring to when you said there is a certain box you felt regularly ripped off from? I had that same experience with glymm, and have been so much happier since switching to topbox. I agree with you; it would definitely be nice if they provide something complimentary for us next month! I believe it was another poster who wrote that they felt ripped off by another subscription box. And yes, Topbox has been great so far! Next Post Kale Chips: Have More Than One!